She thought it was a part for her car. 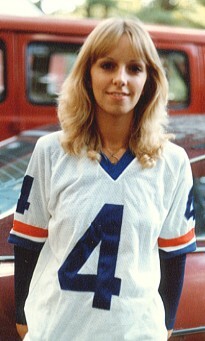 Wendy served in The Team between June 1981 and October 1982. While searching for something else online recently, she accidentally stumbled onto the Team Ministries site and photos of herself from 25 years ago. She immediately attempted to get in touch, and after a couple tries, successfully reconnected with us. 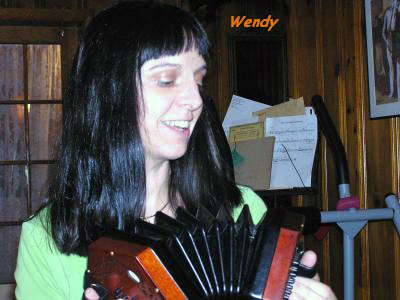 Wendy played "the bad girl" and also backed up Gayle, our musical lead. 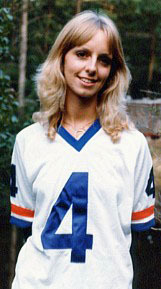 She was on board for the inaugural trip on the Team bus, our 1981 and '82 annual treks to Lyndonville, Vermont, and our first visit to a secure lockup to perform for more than 100 juvenile offenders. and now I live in the town of Lancaster, Massachusetts. Those two things are totally unrelated, but I couldn't come up with anything for the rest of my poem! Anyway, there's more of my disorganized mind scattered around my ever-evolving website, www.bellowbelle.net, which presently is just a simple blog. I was a member of The Team in ... uh ... was it 1982? I think so! Sometime around then. At that time, I was newly divorced and had gone back to using my maiden name. Then, in January of 1983, I remarried, and Tom and I have been together now for 24 years. Our daughter Rainy is a graduate of UMass Amherst, where she majored in Spanish. Tom still remembers going to Vermont with me and The Team in '82. I guess what I most recall from my days with The Team, where I played the 'bad girl' role in the show, is the feeling of 'okayness' that it provided -- I appreciated being part of a group of happy and energetic people. I never really set out to join the show -- and that's a kinda funny story I'll tell in a moment -- but, especially since the previous year or so of my life had been really awful, and I was still struggling to sort things out, I think The Team was quite possibly divinely prescribed medicine for me! I guess what happened is that my friend and eventual fellow teammate, Dan (number 76 at that time), wanted me to be surprised. I still really don't know. Dan was already a part of The Team. I was living temporarily with some very kind friends of Dan's, who were also members of The Team. There were even more of these alleged Team people living in the same apartment building. And that's where I was, visiting the neighbors just briefly one afternoon, when Vin showed up with a script and asked if I'd read something. I still have no idea if he knew that I didn't have a clue about what was going on. What was going through my head then? Well, all I could imagine was that this guy was some kind of really intense, crazy writer, and he'd just put the final touches on his life's greatest work, and he was so desperate for a proofreader that he didn't even care that we'd never met. He just walked right in and asked me to read. So, okay, yeah, I'll read! I mean, what else? The people who lived in the apartment had left to go out for the evening and I was there with this stranger with this very unusual request. Certainly one of the most interesting experiences of my life though, since I thought I was just assisting a writer by proofreading. I read with no intention of getting a part in a play -- no real expression or stage presence. I realized later, once I'd figured out what The Team was and that I'd just joined it, that I was very fortunate to have gotten a part, in light of my awful reading! So, it's certainly amazing how God guides each of our lives, and I am thankful that he does. As for other details of my life ... jobs ... I've had a few and learned a lot. Parenting was and is quite a career. I can no longer play the guitar, not even soft strings, due to having sore hands, but I've been having a lot of fun with the English concertina and a foot bass. And I still sing ... mostly for my cats and dogs and other pets. They're always appreciative! Apparently Dan hadn't explained to Wendy why he'd recommended for me to visit, nor told me that he hadn't done so. As I recall, Dan said something to the effect, "I've got this friend I think would be great in The Team. She sings and can act. I'll let her know you're coming by tonight to talk with her."